"Wow. 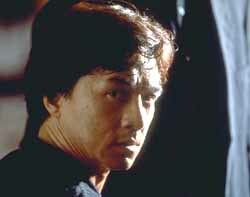 Now I'm James Bond," says Jackie Chan in First Strike and that's exactly what's wrong with the movie. Instead of allowing Jackie Chan to show his martial arts chops, First Strike tries to turn him into a globe-trotting secret agent. 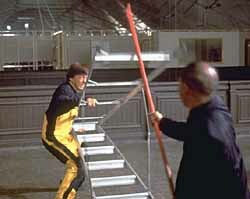 After 45 minutes of chases, the movie finally gets around to its first real martial arts scene, and that scene is a stunner, where Jackie uses a twelve foot ladder to ward off an entire troop of henchmen. But until then it's one chase after another, and they lead nowhere. Disappointingly, even the stunts are more subdued this time round. 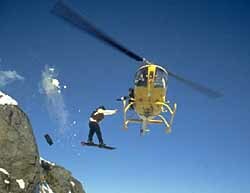 In the scene where Jackie mans a snowboard, we get a nifty leap by Jackie off a cliff and onto a helicopter, but the scene is a dead end. In fact the whole stunt could have been cut from the movie and nothing would have been missed. This is unusual for Jackie Chan's movies: stunts usually play a crucial role--such as the leap across the street in Rumble in the Bronx, where his jump ends the fight and the scene. But the leap to the helicopter leads to nothing. Other stunts in the movie involve underwater fighting. But fights that take place underwater take place in slow motion, without the mind boggling fury customary to martial arts duels in Chan's movies. To try and liven up the underwater scenes, some sharks try to take a few bites out of Jackie and his foes. But the sharks get overused, as Jackie keeps going back into the same damn shark tank. First Strike features Jackie in a role similar to his Police Story movies, where he plays a Royal Hong Kong Police Officer and Bill Tung plays Uncle Bill, his superior. In fact, outside the USA, the movie is billed as Police Story IV: First Strike. To satisfy his legion of fans who love his comedic roles, we get plenty of comedy and mugging by Jackie in First Strike. In fact, I could have used a lot less mugging, such as when Jackie falls into an icy mountain lake: he pauses long enough underwater to shiver, chatter his teeth and mug for the camera. Jackie Chan is undoubtedly one of the greatest action stars in the history of cinema, but First Strike is a big disappointment.